The 9 to 10 -foot Fraser Fir Christmas tree is the ideal size for homes with tall ceilings. It is tall enough to give a grand feel to the room while not being so large that it is overpowering. On average they tend to be wider than the 9 to 10 -foot Fraser Firs. Fraser Firs are ideal Christmas trees for several reasons. Their strong sturdy branches are perfect for hanging large or heavy ornaments. Their natural shape always lends itself to the traditional look of wide at the bottom to narrow at the top. They smell amazing, especially when they are farm fresh! Our Christmas Tree experts will hand pick your perfect tree - please let us know if you have any particulars or if you would like to come to pick it out yourself. 25% Restocking fee for returned trees. Ceiling height - you do not want your tree to touch the ceiling. It could scratch it and it just looks awkward in the room - always leave room for your topper. 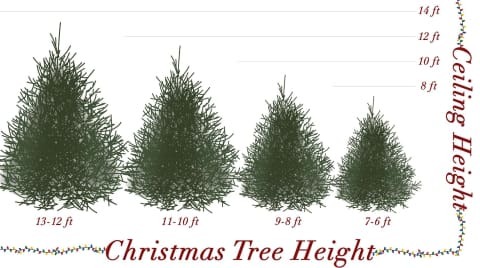 All the Fraser Firs are measured from the ground to the very top - If you like your tree extra full to the top we suggest going up a size to ensure you are happy with the one selected. Our Fraser Firs are 100% American grown and natural - this means that have wonderful character and sometimes there are holes or areas where there is no branching. If you a have very specific needs for the look of your tree please email us at orders@thegardengates.com - we are more than happy to accommodate your requests. When scheduling your delivery date around events, such as family gatherings, parties and decorators please factor in the unknown. Give us at minimum 2-3 days prior to the event in order to have everything with your delivery go smoothly. DO NOT schedule your tree delivery for the same day as the decorator or event. Think about what doorways and pathways you need us to carry the tree through, please measure. If a doorway is too narrow we cannot bring the tree in that room. Place a towel or blanket on the floor to protect it from scratches. If your tree has lights, have the surge protector and extension cords ready for installation. We want you to love your tree as much as we do! If you have any questions or special needs please contact us at orders@thegardengates.com or 504-833-6699.